Low tempuratues and things that cause items to drop their tempurature dramatically fascinates me, or simply process of taking away lots of heat energy from random items around is quite fun. 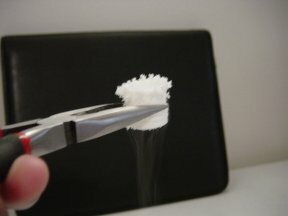 And one of the easiest ways to do this is by letting something evaporate fast taking away heat from around it, and normal gases in the liquid state do this really well. Liquid Nitrogen is quite fun because of this, better yet the cost to fun ratio is also good, but sadly its hard to get a hold of (suppliers get real suspicious when a college students ask for some). Well not to worry, there is an alternative. Just like its hard to come by radioactive material but you can get small amounts (~5 microCuries of Americium 241) from your ordinary somoke detectors. Less than great, but better than noting. DISCLAIMER: If you attempt to this at home, beware that this may affect your central nervous system, give you frost bites, die, get high, or a combination of these. Don’t blame me if any of these happen to you. You can buy these at any store, walmart, sams, bestbuy, fry’s, almost anywhere they sell computers or related. Gases in them vary, but in what I used, it had (1,1-difluoroethane). How it works: at factory, they compress that gas into the can, and as they compress the gas will turn into liquid, and after some time the can will have almost all liquid. When ever you use the can, the gas accumilated on top will be sprayed out, and to compansate for the pressure loss inside the can, the liquid will turn into some more gas, and the cycle continues until all of the gas inside is let out, google for more info. So back to what I was saying before, if you follow the directions on the can, it says to use it upright so only the gas phase will be sent out. To get the liquid, simply turn the can upside down and slowly press so it drips the liquid. Make sure your hands arn’t in its path since this can give you very bad freeze burns. You can freeze stuff by simply turning upsize down, and letting it spray the gas. What you don’t want to do is to go up behind someone, and slowly letting a drop of this on somoene’s neck (good times in Tech). 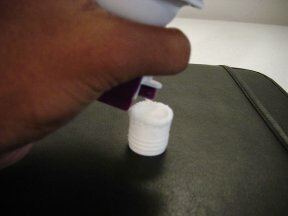 Anyway, I let this drop for a while into a small cup (took it off a glue stick). In about 30 seconds, the whole cup was covered by condensations and its beautiful crystallized formations, and it is also interesting to see the cold air pouring down from it. 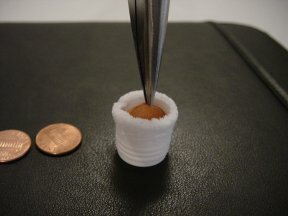 First thing is first, freeze a penny. When I lowed the penny into the liquid, it spashed or started boiling insanely so be careful, . Then when I took it out, water started condensing on the penny and becoming ice, was interesting (not sure why I don’t have a picture of that). I refilled the cup was almost empty now. Then I dipped in other various things, poured this into random stuff, and below is what gave the most interesting results. 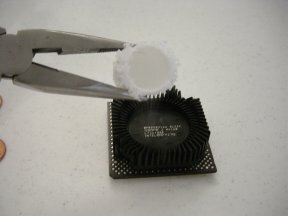 I was looking around, and in my old junk box found a nice pentium chip with a heatsink that seemed ideal for what just came to mind. 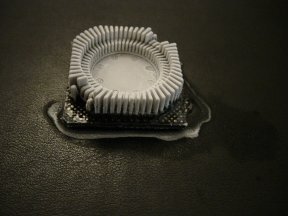 Pour that stuff all over the heatsink (will evaporate really fast cooling it). Suprise Suprise, the processor and the heatsink is insanely cold. My attempt in trying to lift it with bare hands left me with a nice freeze burn with the nice grill imprint. So yeah, don’t touch that are being frozen this way, its bad for you. So there you have it, hope you enjoyed this read although this is probably most useless thing I have written so far yet I enjoyed doing it anyway. 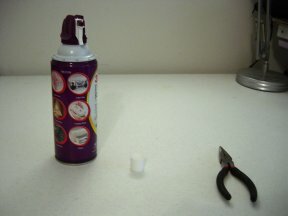 I will most probably buy one of those 6 pack compressed air can’s (pretty cheap) from Sam’s or somethwere, empty it to a large container and try something interesting with it, which I have yet to decide.